What is the “Fiduciary Standard of Care” and how does it affect me? Fiduciary standard of care is the highest degree of business responsibility one person can have to another. It means that those who provide you with advice must act solely in your best interest, always put your interest ahead of their own. A federal law, the Investment Advisers Act of 1940, requires Registered Investment Advisers to meet this Fiduciary standard of care. Advisors of Cornerstone work in a fiduciary capacity. Does Cornerstone serve as a Fiduciary to its clients? Yes. Please see a fuller explanation of what this means above. Prefer to work with an “Independent” financial advisor, one who is free to access investments and insurance products from any provider. Would like a big picture, cross-disciplinary review of their financial matters. Not from just an investment, or just an insurance, or just an estate planning, or just a tax planning perspective; but instead, across the board. This is similar to having all their advisors around the table at the same time. Feel that they either do not have the time or experience to fully manage their own financial matters, or seek coaching in these areas. 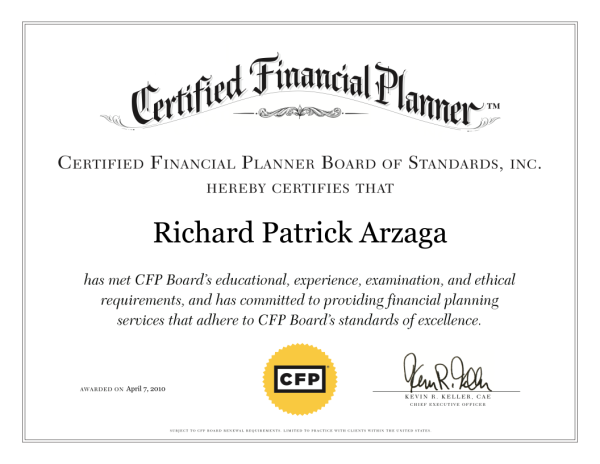 Are you a CERTIFIED FINANCIAL PLANNER™, CFP®? Our office has advisors who hold a variety of licenses, designations, and accomplishments. Yes, the CFP® designation is among these designations. The CFP® is perhaps the most widely recognized in financial services, with very well-defined professional standards and processes. Our advisors maintain additional credentials focused in other service areas, including teaching, real estate, investments, retirement income, business exit planning, estate planning, insurance and long term care. Click here to learn more about Working with a CFP®. What are your planning fees? Our minimum one-time planning fee is $3,500. This can increase based on complexity. A flat-fee quote will be provided in the same visit following a collaborative assessment of your current plan and needs, our observations of coordination gaps, and potential areas for improvement. One-quarter (25%) of the fee is due upon engagement, and the remainder is due upon completion of the plan or 90 days, whichever is shorter. Click here to review our ADV2A Disclosure that is required with all planning agreements. Click here for a copy of our current planning agreement. Generally, two months or less. We have had some plans fast-tracked and completed in a few weeks. Others have taken considerable more time due to their complexity. How do you feel about insurance? We love this question (although we realized we also asked this question, so what’s not to love?) We believe that a good financial plan starts with understanding the potential coordination gaps and areas for improvements in a family’s current plan. Part of this is assessing risks in their current plan. We are licensed insurance brokers, and can assist in education, competitive quotes, and insurance applications. We recommend insurance only if there is a compelling need. In all, insurance transactions represent less than 5% of our total work with clients. Yes… and no. Yes, for our own planning, we follow the same principals we share with clients. We are grateful for this insight that should help our own families in the years ahead. But no, we are not in every investment recommended to our clients, and no clients have the same plan. The reason is, it would be unsuitable to assume everyone is in the same boat. For example, giving everyone the same advice would assume that we all have the exact same needs, goals, aspirations, family profile, risk-reward profile, time horizon, tax bracket, liquidity, cash flows, and the list goes on. Since this cannot be true, client advice is unique to each client. No plan or portfolio is exactly the same. Further, we are pleased that we don’t offer what many advisors offer to their clients: “Five or six buckets that suit all clients.” Big picture, we don’t see how compartmentalizing our clients serves them well. Yes. We frequently work with our client’s legal and tax professionals, and prefer to do so as needed. If you are seeking names of other professional advisors, we are happy to make a connection for you. Tax and legal services are not offered by Cornerstone, LPL Financial or affiliated advisors. What are your minimum investment requirements? The short answer is $500,000 of investable assets. Exceptions to that include clients with concentrated values in their business, real estate, or stock options. Other exceptions include estate planning and risk management planning. That said, parties of all investment levels are invited to contact us for assistance. We have taught and mentored hundreds of financial planning professionals over the years. With confidence, through these relationships, we will likely be able to match a client’s questions and needs with an introduction to skilled and suitable advisors. Many of our clients have assets that we manage valued at more than $1 million, and based on a graduated declining scale pay 1% or less. The fee is an annual percentage, and is billed quarterly by applying one-fourth of the annual fee. We do not receive additional commissions on advisory assets, and accept no other forms of compensation from your investments from investment product providers or financial institutions. What happens to the custody of my accounts and my investments? Who has my money? Cornerstone does not have custody of its clients’ accounts. We work with third party Custodians who serve as gatekeepers for your assets. We do not have the ability to access or withdraw your cash or investments without your authorization. We think this is an important distinction of Cornerstone as some advisors do custody and have discretion of their clients’ accounts. In addition, Cornerstone does not make any changes or updates to your investment strategy without your permission. How often will you make changes to my portfolio? Your account(s) will be traded only when our investment strategy dictates a change. Because our advisory accounts charge a flat fee, we have no incentive to trade your account(s) other than to follow our investment strategy. Can I review my account(s) online? How often will you meet with me/us? Best case, review meetings and communications occur regularly with each client. We have a preferred sequence of review meetings that cover investments, financial planning, and year-end strategies. Your own schedule will determine what frequency works best for you. In addition, our door is always open, and we are just a phone call away. We encourage you to call with any matter that might appear to you big or small. Do you advocate the use of real estate investments or other alternative investments? It depends on the client and their circumstances. The long-short answer is, following a successful exit of a technology company, Rich Arzaga CFP®, and founder of Cornerstone, found himself looking for help from an financial advisor. Among his assets, his family owned directly-held investment real estate. Rich could not find an advisor who could professionally incorporate that type of investment into a total plan. Seeing an opportunity to help others who have a substantial amount of their assets in real estate, Rich became the advisor he sought. Fast-forward to today, and real estate investments remain a part of the overall planning work offered by Cornerstone. That said, advice given on real estate and other alternative investments depends on the suitability of the clients we serve. Am I locked-in to Cornerstone? Are their termination penalties or fees? There are no barriers to exit a relationship with Cornerstone. The relationship is terminable on written notice, at any time, without penalties from Cornerstone. There are no forced liquidations, no termination fees, no back-end fees, no redemption fees or other charges associated with the termination of an advisory relationship with Cornerstone. What happens if you get hit by the proverbial bus? As we lie on the debris for last rites, your assets remain with custodians, fully invested. Your fund managers remain in place, although speaking personally it would be nice to see them invest less in bus companies. Other LPL advisors in other offices will be identified to help. These would be advisors who are nearby, but not too close to bus routes. You are invited to the services, but we cannot vouch for the catering performance. In short, assuming worse case that the entire office is gone, there will be no changes to your financial matters, and another LPL licensed advisor will be able to assist you long term, or to review your options. All advisors with securities registrations must be affiliated with and supervised by a broker/dealer. LPL is the broker dealer we have selected to work with. As reported in Financial Planning Magazine, June 1996-2017, based in total revenue with over 14,000 advisors, LPL Financial is among the largest independent broker dealers in the country. In addition to regulatory oversight, LPL provides a great many services to advisors and clients. These services include account custody and clearing, reporting, technology, practice management, and compliance services. As we continue to grow and look to the future, LPL Financial is committed to remaining a trusted, objective resource for our advisors and their clients. How do we get started? What is your process? Determining if working together is a good idea starts with an initial meeting to assess your goals and needs, and for us to help identify potential coordination gaps and areas for improvement. At that time, we will be able to outline for you a scope of work, and a fixed fee. If we agree working together is in your best interest, then we will work with you through our collaborative planning process. Following delivery of your plan, if both parties feel that the experience was productive and that further assistance is desired, then Cornerstone can help you implement, manage, review, and modify your plan for the long term. To get started, please contact our office at (925) 824 2880 or send us a message. We look forward to hearing from you what you would like to accomplish in your financial life.